With the Alp Tracks line, Movement has levelled up in their quest for the perfect lightweight backcountry skis. Using a labor-intensive carbon fiber construction process, the Swiss company has managed to make skis much wider than their previously top-end X-series designs, which topped out at 89mm underfoot. The AlpTracks build process uses the highest quality carbon fiber arranged in a clever, multidirectional manner around a light wood core. They further strengthened the skis with mini-sidewalls underfoot to make them relatively damp and resistant to rock damage. The Alp Tracks 106 is the ultimate wide, lightweight ski for blasting powder and ripping in variable conditions. Truly a ski to behold. And ski. ABS Shock Absorber is a mini-sidewall underfoot that dampens the ride. Tour Edges are variable thickness, adding material in key impact zones. VA-Tech vibration absorber is a rubber-infused fiberglass in the ski tips. Shaped with a rockered tip and friendly sidecut amenable to skiing fast. Double Plate Reinforcement is two integrated layers for binding strength. P-Tex 5000 bases are hard to resist rocks and fast to resist spring snow. Ultralight wood cores follow FCS & PEPS forestry management standards. I currently have DPS 99 Tour 1 - how will these ski? Will these still be surfy and fun or will they need to be driven hard all the time?? Hi Kent, while the Alp Tracks 106 is definitely a different shape and feel, it won't need to be driven hard and actually prefers not to be. That's not to say you can't ski it hard and fast, but it prefers a more balanced mid-foot input. The praise for this ski has been really high and spread across a pretty diverse set of abilities and backgrounds. I'm curious about choosing a length of this ski. I currently ski on the Scott Super Guide 105's in a 183 cm and given the profile of this 106 I am leaning towards the 185 cm, but would like to get some feedback. With a more traditional shape (less rocker and decent amount of camber) I typically ski a 180 cm. However, for large rocker skis I have a pair of 188's with 115 cm under foot. I would consider myself an aggressive/expert skier at 5'10" and 170 lbs. Most of my touring is in the greater Yellowstone ecosystem, mostly Tetons, and BC Canada. Hey Dustin! I'd probably go for the 185cm option based on what you said. Do you have the MOVEMENT ALP TRACKS LT 106 or DPS Tour 112 available for demo? I was in today over lunch looking at them. Jared-We currently do not. But give us a call and we can discuss some options. Hi Jared, actually we did just get an A/T 106 177 added to the fleet! Could anyone compare this ski in 185cm to a BD Helio 185? I currently have the latter and think it skis very well but at 6'3" and 210lbs I push it to its limits, especially in terms of durability. 2 seasons on my Helios and I've got lots of damage, and thinking of replacing with this ski but concerned about durability and adequate stiffness. Thoughts? Hey Ryan! There's more than enough stiffness behind this ski to rival the Helio 105, though I am interested in hearing what boots you'll be mounting on these? Durability-wise, just make sure when you go out to ski with them, you keep them on the snow (no hucking). If it's used as a mid-winter soft snow ski they'll be amazing. 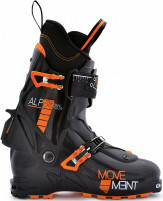 They tend to be better matched with lighter touring boots versus freeride boots. Hi Ryan, the P-Tex and edges are very hard and impact resistant. Like other silly-light skis, however, the core could be compromised if used as a cliff-hucker. Thanks to you both. I have a variety of boot shells, all of which I run with Intuition Pro Tours: first generation Maestrale, Atomic Backland Carbon and even some old green BD shells I forget the name. I do my best to keep my skis on the snow, but I do like to ski fast sometimes and constantly find myself skiing fast deep pow, jump turning tight couloirs, variable conditions, breakable crust through the alders, all in the same day. Hey Ryan! Nice! This'll do really well at skiing fast and deep pow with any of those boots. There's a good amount of tip rocker and the long sidecut will make the ski fairly manageable in crust actually. The vast majority of people we see on this ski are cruising around with boots in the same weight category as the Backland Carbon. They do really well with the lightweight boots! Hi Ryan, see here for a video of them being skied fast! Hi, I plan to put some inserts into my AlpTracks 106 skis (and want to do a good job!). I've installed inserts in before in other skis, but was just wondering if anyone had any comments/tips/warnings about doing it in the AlpTracks. I haven't installed them in carbon topsheet skis before, and the AlpTracks may have slightly unique construction, so I was wondering if there were any differences to consider. Thanks in advance. No differences to consider when installing inserts in these skis. Business as usual! what is the difference between the MovemeNT ALP TRACKS LT 106 and Movement Alp tracks LTD 106? Hi Igor, there is no difference. Much of the Movement marketing material refers to LTD, but the skis themselves were imprinted with LT. They've actually dropped both from the skis for 17/18, and also from the marketing materials for 18/19. But the fact remains that all the Alp Tracks are handmade, Limited Edition skis. Are these this year's or current model. Hi Thomas, the current stock has last season's graphics. The new graphics will be arriving in a couple weeks. We are happy to get either color for you. Awesome thanks. Is there a difference in the construction from last years to this years? Hi Thomas, it's just a color update for 17/18.